EasyJet's profits have fallen during what the airline called a "difficult year for the aviation industry". Pre-tax profits in the year to 30 September fell 17.3% to £408m, in line with guidance given last month. Passenger numbers rose 9.7%. These are the last results overseen by chief executive Carolyn McCall, who is moving to become head of ITV. 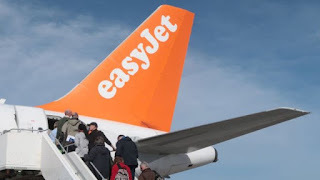 "EasyJet's model is resilient and sustainable and we now have a huge amount of positive momentum," she said.